Hermes Investment Management has made a couple of lettings at its Abbey Gardens office complex in Reading. 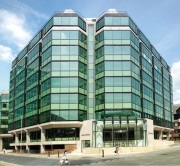 The £26bn manager has signed up Inframon and Premier Group to Abbey Gardens South for a total of 10,200 sq ft.
Inframon, a specialist cloud service provider, has taken 2,644 sq ft on the ground floor on a five-year lease term, while recruitment firm Premier Grou has taken 7,556 sq ft on the fifth floor. Stephen Ellis, asset manager at Hermes said: “These two lettings are a major turning point for this building following an extensive refurbishment to create grade A office space with excellent natural light, large floor plates and outstanding views over Reading. Campbell Gordon, Strutt & Parker and Montagu Evans acted on behalf of Hermes; Inframon and Premier Group were both unrepresented.